Our standard ink colors can be found below, and are also available in a swatch book. Once you choose an invitation design and put down your initial deposit, if you decide to customize your colors we will mail you a color swatch book so that you can see how the colors look on paper first hand and finalize your design. If you do not see your dream color below we can also utilize the Pantone Matching System for an extra charge. This is a bank of almost 2,000 individual color formulas. 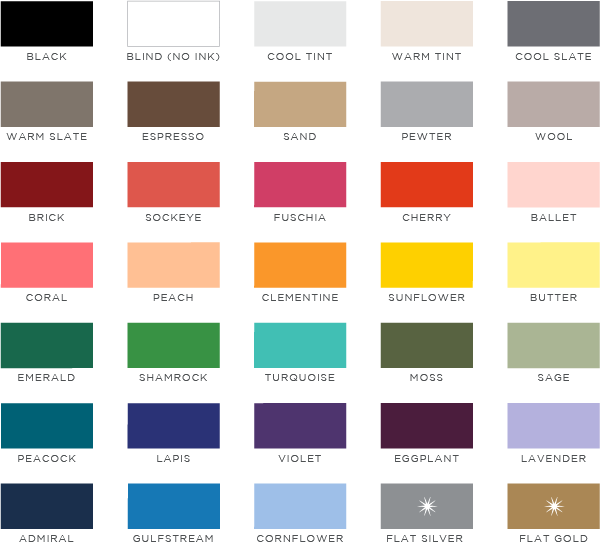 When it is time to choose your custom colors, you can pick your favorites from the options below and we will mail you Pantone chips in the range of that color to choose from. Whether it is a custom or standard color that you envision, we find it best to make your final choice from in-hand color swatches or chips because colors can often look different on the computer monitor than they do on paper. Foil colors are more standardized, as they are actual metal or pigment leaf applied to a backing paper, and wound on a roll. Choose from the foil colors below and once you select an invitation and put down your initial deposit we will mail you a swatch book to help you finalize your design choices.